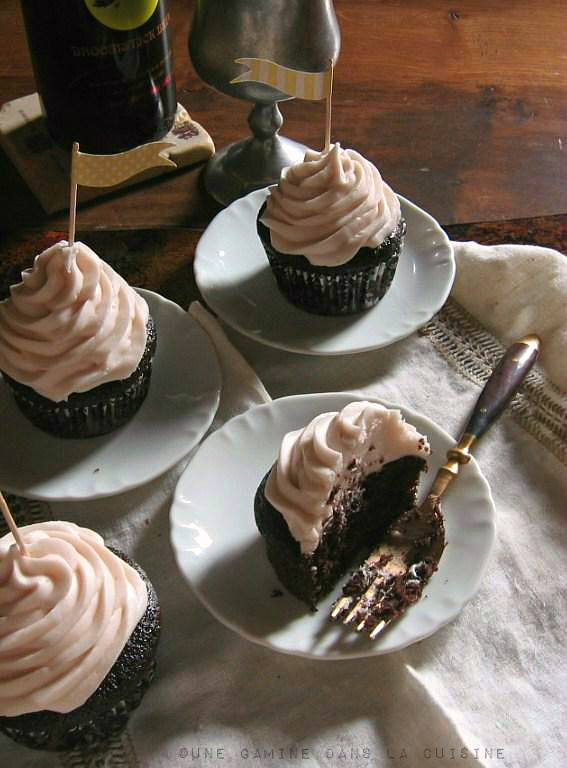 the place of caught breath…"
~ Margaret Atwood, from "Shapechangers in Winter"
I'm also enjoying the last cupcake from this rather boozy recipe. 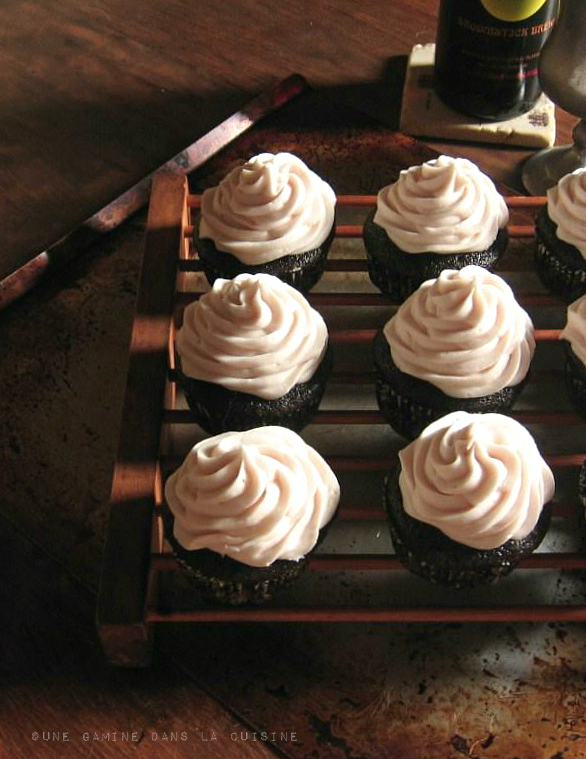 Last March I made these Guinness cupcakes with a Nutella cream cheese frosting. It was Aaamazing!! This time I had a bottle of sweetly-spiced wine staring at me on the counter. How could I possibly disperse the idea of a wine buttercream-cream cheese frosting? In the bowl of a stand mixer, fitted with the whisk attachment (or any large mixing bowl, it you're using a hand-held), combine the Guinness, whole milk, oil, and vanilla extract. Beat on medium speed until combined. (If it's too slushy, you can turn the speed down to low.) Add the eggs one at a time, beating for about 1 minute after each addition. Add the buttermilk and beat until well combined. Prepare the frosting: In the bowl of a stand mixer, fitted with the paddle attachment (or any large mixing bowl if you're using a hand-held), beat together the butter and cream cheese until smooth (about 3-5 minutes on medium speed). Add the salt, and super-fine sugar (if using). Beat until well combined. Either pipe out the frosting, or use a small off-set spatula. Decorate as desired. So festive and divine sounding/looking! A great idea. Love, love, love! Wish I had one right now :). Love the Margaret Atwood quote - and the cupcakes look pretty amazing too! Bon hiver, indeed. What a perfect little cupcake. I can see how moist they are through the pictures. Wow! Holy cupcakes!!! I love these, Val! OMGoodness, I want to bake them right now!!! Where do I even begin with this one - WOW! Okay the cupcake batter itself, the Guiness, the Dark cocoa, the buttermilk, milk, butter...mmmm, we're off to a great start. Then the wine-ey buttercream. I wonder if I could just have that forever and ever ? I'd be so happy! You outdid yourself, Valerie! And your frosting piping is soooo perfect. What tip do you use? I am the worst with pastry piping bags! I love your festive cupcakes with their flags;-) The lighting in your photo is so pretty-hard to believe it's almost the end of the year!!! Those cupcakes look perfect for a cold winter's day - they are so pretty too. Down here we are in full summer with lovely warm weather but we are getting the edge of the cyclone which devastated Fiji and Samoa tomorrow. Holy mother of buttercreams! That is freakin' brilliant! 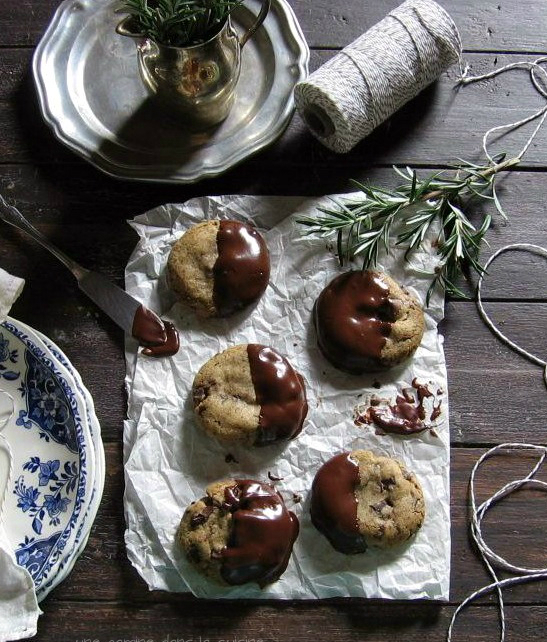 I can picture myself going down in baking history for serving these at a party. They are gorgeous and what a fun flavor combo for a celebration. i too must sit with my legs curled up :) i am so intrigued by this combination of guinness and red wine, i've just gotta try it! Wow, Valerie! These look & sound amazing! 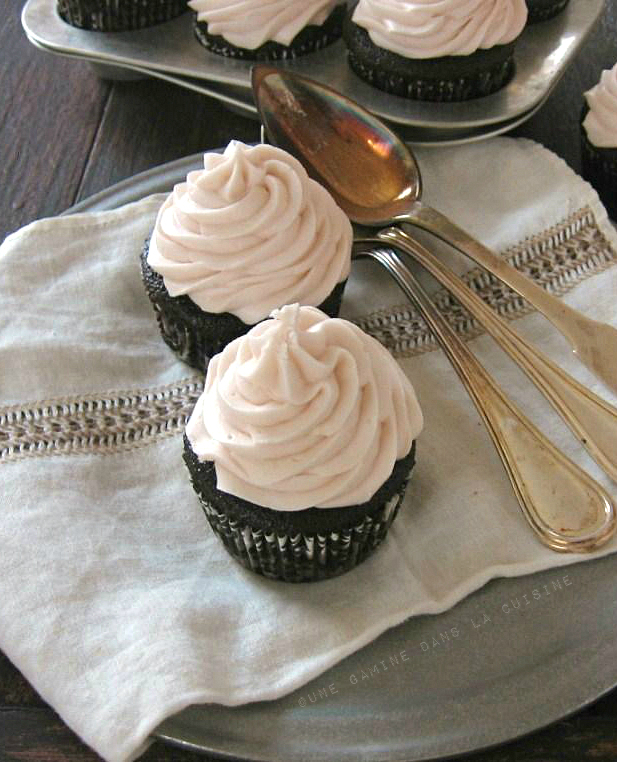 These cupcakes just scream winter comfort! And now I totally want a pair of wool leggings. 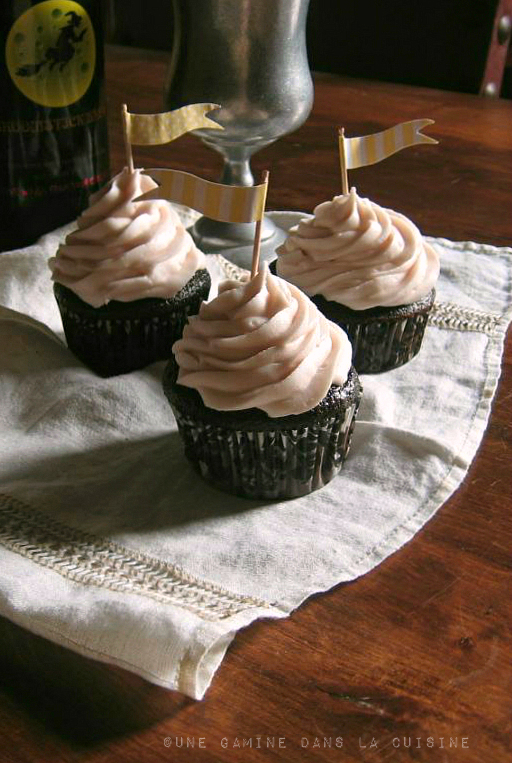 Oh, I just love the idea of boozy cupcakes :) They are gorgeous! I'm so jealous of your snow and that I didn't get to eat one of these wonderful sounding cupcakes. Sounds like you have the perfect Christmas weather! What a magical cupcake! Love the boozy touch. 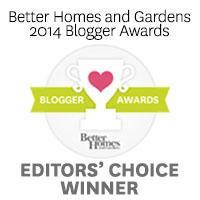 Your photos are stunning!!! Valerie you are most definitely not the only one who can't sit with their feet on the ground :) as I sit here enjoying the view from the window and looking at all the pretty snow I too have my favorite cozy pants and socks on with my iPad resting on my knee's on the couch! I'm sure these cupcakes are very delicious, and always lovely photos! oh, wow! I'm in love with all the flavors here, Valerie. So creamy and wonderful. The piping is perfect.